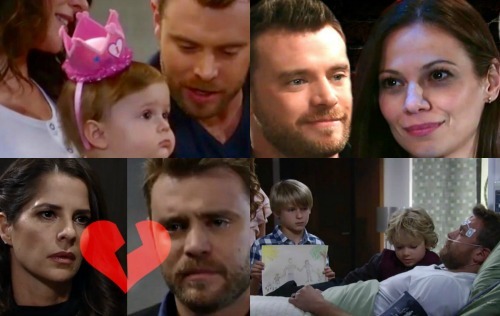 General Hospital (GH) spoilers tease that Drew (Billy Miller), Sam (Kelly Monaco) and Griffin (Matt Cohen) will all cross paths down the road. A TV Insider interview with Cohen pointed to a storyline featuring these three, so it sounds like trouble’s brewing. Drew may need Griffin’s assistance thanks to a botched memory procedure. Will Drew’s memories overtake the memories he made as Jason? Sam’s currently falling for the real Jason (Steve Burton) again, but that doesn’t mean she’ll stay with him. This could easily be a detour on Drew and Sam’s journey. With soapy love stories, you just have to be patient and let it all play out. Couples often reunite, but it can take months of angst and plot twists to make it happen. Let’s say Sam and Jason get back together. They certainly seem to be on the verge of doing that! General Hospital spoilers hint that they’ll come close during May Sweeps. It’s clear that Jason and Sam are struggling to fight temptation. They may cave in and embrace their GH reunion soon enough. Meanwhile, Drew may be drawn to Kim (Tamara Braun). Even though he can’t remember their past, Kim obviously cares about her former flame. Drew will feel that love and it could stir something inside him. It may not take memories to produce a spark. If they build that foundation without Drew’s memories, can you imagine what it’ll be like once he has them back? Drew and Kim’s passion could really reignite! However, there may be a real problem. If Drew loses the real memories he made as Jason, he won’t remember anything about the life he had with Sam. That means Danny (T.K. Weaver), Jake (Hudson West) and even little Scout would become strangers to Drew. Jake would be particularly crushed if his uncle couldn’t recall any of the time they shared together. Likewise, it’d be heartbreaking to see Drew forget Scout’s birth and everything since. Sam would definitely hate to have their history erased as well. This would be a great way to pull Sam back toward Drew. She could become determined to help him restore those fake Jason memories while keeping his Drew memories intact. It’d be a tricky task, but maybe that’s where Griffin could come in. He might be able to recommend a solution to the problem. Since Griffin’s been keeping Peter’s (Wes Ramsey) secret and preventing justice, this could be his way of making amends. Griffin could make it his mission to make things right in Drew’s mind. Whether he handles it himself or calls in a specialist, Griffin would be willing to try just about anything. Will Sam be by Drew’s side through it all? Will this lead to a new love triangle for Sam, Drew and Kim? Where does that leave Jason? We’ll give you updates as other General Hospital news comes in. Stick with ABC’s GH and don’t forget to check CDL often for the latest General Hospital spoilers, updates and news.